Was It Revised? : Yes, in 1972 by Priscilla Baker-Carr. Cover: Rudy Nappi. Hate it. So dark. Very symbolic by throwing together elements in the book that don’t belong in the same scene. That shrunken head? Appears in a benign setting at the very beginning of the book and then disappears. Yet here it is front and center as if the Hardy Boys are going to face down headhunters. Nope. Don’t like this one, Mr. Nappi. Where’s Fenton This Time? : Once again working on the same case, at times working with the boys, and at times he gets called urgently to Washington. And then when the boys need him more than anyone, at an extremely serious climax danger situation, uh, he’s in Washington. Sorry, boys, find someone else to do the job. Bad, Fenton! Which Chums Show Up? : Chet, Biff, Tony, Callie, Iola. And Maria Santos and Judy Rankin. Who? Exactly. Nice try, Mr. Almquist, but no banana. What’s Chet’s Hobby This Time? : None. Oh, and he’s back to being a coward again, just as we like him. Always nice to have ol’ Chet worry about horrible ways to die. Aunt Gertrude’s Dessert: She merely tut tuts about how dangerous things are, and the boys consciously lie to her as usual. You don’t deserve pie when you do that. Plot: Tony inherits some curios from a late relative’s shop in New York City. At that exact moment a gang of crooks from Guatemala show up in Bayport and try desperate and dangerous things to get those curios. What are they after? Why are they willing to attempt murder for it? Why does it always, always, always happen in Bayport? Review: Starts off hot, with a villain who is do unrelentingly desperate to get the goods that it’s amazing. Chapters 1 and 2 are like having a rabid dog trying to get your hamburger — he does not quit no matter what. It’s quite a start. 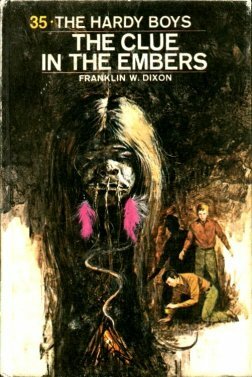 But then the mystery basically turns out to be, What Do They Want?, and once they figure that out, it’s the ol’ find the buried gold that the Hardy Boys can find instantly but the natives couldn’t find for centuries. Riiiight. “Joe shook out the contents of the envelope and selected one of the firmer tiny charred pieces. He clamped this in place on the microtome. Then, running a finely honed knife blade delicately through it, Joe cut off a section. “About two thousandths of an inch,” Frank replied. Working carefully, Joe cut other tissue-thin sections from several angles, letting them drop onto a glass slide. In a few moments Frank had prepared several photomicrographs of them, showing distinct wood grains. When you are a ten-year-old, this stuff is dynamite! You feel like you are really learning stuff. But on the whole, just a middling effort with some nice aspects and a depressing cover.